Hardback. 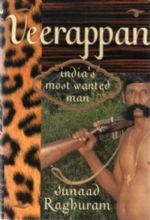 Veerappan: poacher, smuggler, killer - a fugitive who for more than three decades sustained a crime frenzy as action packed and outlandish as anything Hollywood (or even Bollywood) could conjure. Determined to escape the crushing poverty of his childhood village, Veerappan was lured to a life of crime in his adolescence and eventually amassed a gang with as many as 150 members. He kidnapped wealthy men, poached precious resources, and viciously ambushed police, killing more than a hundred. He stole such great quantities of explosives from nearby granite operations that the government ordered the industry to shut down. Yet he continued to avoid capture, despite the government's creation of a special task force, the sole purpose of which was to stop him. The impenetrable Indian jungle provided him with shelter and refuge, while villagers, whether from fear or admiration, protected him from the police, so that year after year he grew bolder and more power hungry. His most audacious act - the kidnapping of India's biggest film star - which caused nationwide public upheaval and brought the film industry to a halt, while his demands for ransom presented the government with a crippling legal dilemma. The author followed Veerappan's violent progression from a small-time poacher to the bloodthirsty criminal who flouted the entire Indian police force and government for decades. Using the personal testimony of Veerappan's family members and closest associates, the author recounts this outlaw's crimes and examines his personal life as well, including a surprisingly touching first person account of what Veerappan's wife had endured. A book detailing the methods and madness of a man alternately hailed as a messiah and condemned as a murderer. Illus., Epilogue + Glossary of Selected Terms. 284pp. 8vo. h/back. From the library of true crime writer, Wilfred Gregg, with his personal b/plate. Includes loosely inserted newspaper article reporting Veerappan's death. Review copy. F. in F. dw.